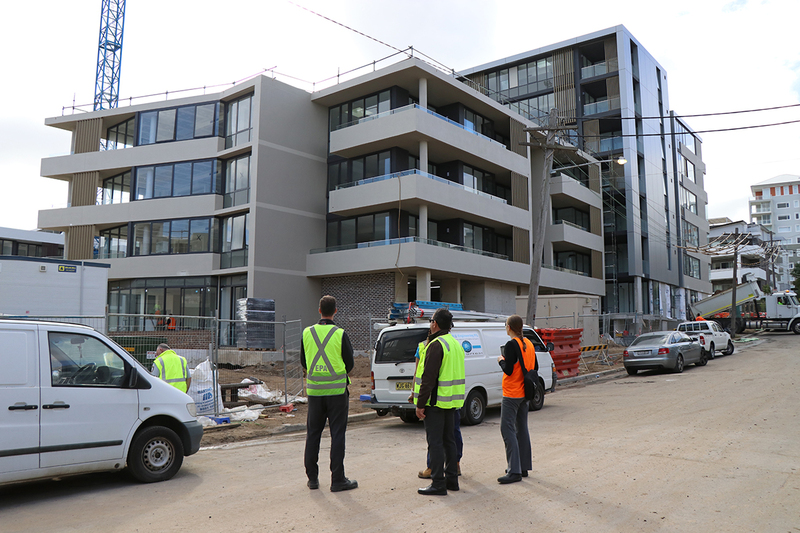 Photo of council compliance officers inspecting a development with site foremen. As part of our mission to make the Parramatta River swimmable gain by 2025, the PRCG initiates and participates in a wide range of projects, activities and events, that contribute towards improving the health, accessibility and management of the river. The suburbs around Sydney’s waterways are booming. Our growing population and need for more housing, schools, roads and other amenities has seen a rise in new residential and commercial developments and construction, as well as increased public expectation for a quality, local waterway which we can safely use for leisure activities. Did you know that up to four truckloads of soil from a building site can be washed away in a single storm if not properly contained? If sediment such as soil, sand, dirt and mud are not properly managed on building sites they can directly pollute our river and cause severe environmental problems, making it less safe for people to use. 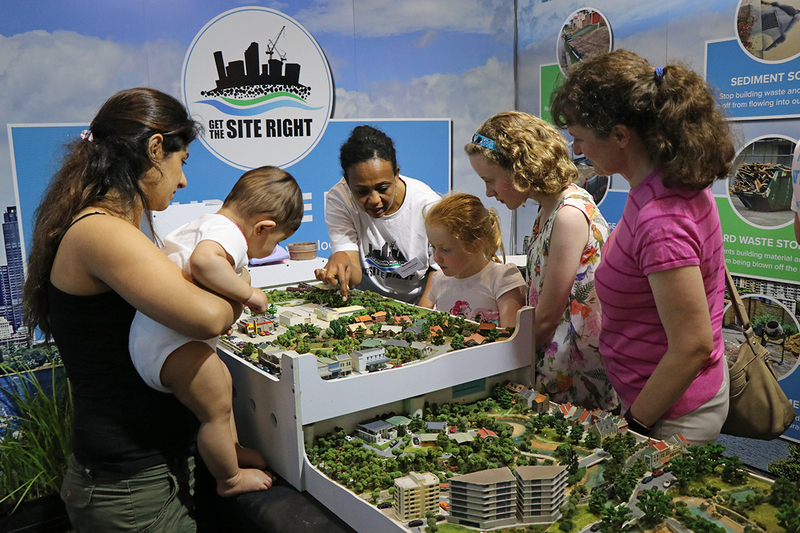 Get the Site Right is a joint taskforce between the Parramatta River Catchment Group, Cooks River Alliance, Georges River Combined Councils Committee, Sydney Coastal Councils Group, Lake Macquarie Council, NSW Environment Protection Authority (EPA), and Department of Planning and Environment, and more than 20 Sydney councils. We are working together to target developers and enforce best practice on commercial and residential building sites, as well as major infrastructure projects, to protect our waterways and surrounding environments. Directly pollutes our creeks, river and harbours by filling them with dirt, soil, sand and mud. This leads to poorer water quality, affecting swimming or leisure activities in and around our waterways. Destroys aquatic habitats and smothers native plants and animals that live our waterways. Blocks stormwater drains leading to flooding and overflows. Erodes creek and river banks. Causes health and safety risks such as slippery roads and tripping hazards. There are rules that developers need to follow to contain and manage sediment on their work site in a responsible manner. It is against the law to breach these rules. Local councils and the NSW Environment Protection Authority have the power to issue penalties from $8000 to $15,000 for each incident. Report all pollution incidents by calling the NSW Environment Line on 131 555 or contacting your local council. If you are building or renovating a home, submission of an Erosion and Sediment Control Plan is required before works begin. Ensure your builders are adhering to the rules. For more information, click here or contact your local council or the NSW Environment Protection Authority for further consultation. If you are a developer or managing a building site, download a quick summary of the facts or consult the NSW Office of Environment and Heritage’s ‘Blue Book’ for detailed rules and guidelines. The Parramatta River Estuary Coastal Zone Management Plan (CZMP) is the legislated plan to protect and rehabilitate the coastal environment of the Parramatta River estuary, including the waterway, bays, foreshores and adjacent lands of the Parramatta River and its tidal tributaries. This area extends from the tidal limit at the Charles Street weir at Parramatta, to Yurulbin Point, Birchgrove and Clarkes Point, Woolwich, in the east. The Parramatta River Estuary Coastal Zone Management Plan was formally certified in accordance with Section 55G of the Coastal Protection Act by the Minister for Planning, The Honourable Rob Stokes, on 31 March 2016 and appeared in the NSW Government Gazette No 56 on 1 July 2016. Development of the Plan and its gazettal was supported by the 8 Councils* within the Parramatta River Estuary, as well as Sydney Water, Roads and Maritime Services, Sydney Olympic Park Authority and Office of Environment and Heritage. Each of these agencies have specific actions within the Plan. *Please note, since finalising the plan, some Councils have been amalgamated: Leichhardt and Ashfield Councils are now Inner West Council; Auburn and Parramatta Councils are now Cumberland Council and City of Parramatta Council. Download a summary brochure of the Plan. Chapter 7 – Conclusions and recommendations; Chaper 8 – Qualifications and assumptions; Chapter 9 – References. In depth research was undertaken to inform the development of this plan. Read about this at our Research about the River page. To incorporate ecologically sustainable practices as the foreshore faces increased development and changes in land use. Greater Sydney Commission’s GPOP (Greater Parramatta to Olympic Peninsula) Plan Direction 11: Make Parramatta River a great living waterway and connector, where people enjoy walking, cycling and safe swimming. To capture and treat stormwater and reduce sediment entering the Parramatta River estuary. Feasibility study completed and installation underway by City of Ryde of a complete stormwater capture and harvesting system in Peel Park, including a first phase gross pollutant trap, UV treatment and tank storage for irrigation and pre-treatment before being released into the Parramatta River. Works planned for completion mid-2017. Ongoing implementation of Hunters Hill Council Stormwater Management Action Plan, including cleaning of the Riverglade Reserve ponds and annual inspection and cleaning of all stormwater quality improvement devices across Hunters Hill local government area. Riverglade Reserve (two traps installed) by Hunters Hill Council. Birchgrove Oval by the former Leichhardt Council. Bill Mitchell Park, Gladesville by City of Ryde. Deakin St, Meadowbank by City of Ryde. Mona Park, Auburn by the former Auburn Council. Community education program implemented by City of Ryde on the impact of litter entering stormwater systems and the Parramatta River, including the provision of car waste bags, drain stencilling, promotion of litter impacts at two events, schools litter competitions, litter pledges and bus shelter advertising. Audit of existing Litter Traps across the former Leichhardt local government area completed and feasibility study for additional Litter Traps underway. Design for bank stabilisation works with natural materials and vegetation completed by Cumberland Council for two reaches along Duck River (approx. 20-30m adjacent to the Auburn Botanic Gardens and 50m reach adjacent to Mona Park) and works identified on Cumberland Council’s Operational Plan 2016-2017. Ongoing, daily collection of litter from the estuary by Roads and Maritime Services. Stormwater Management and Water Sensitive Urban Design Policy developed by Sydney Olympic Park Authority. Parramatta River Water Quality Modelling underway to prioritise management interventions to improve river quality for swimming. Get the Site Right sediment and erosion control compliance campaign coordinated across the catchment, with over 200 development sites inspected in October 2016. To enhance and protect aquatic and foreshore habitats and improve ecosystem health. Priority habitat corridors across Cumberland, Strathfield, Ryde, Hunters Hill, Parramatta, Blacktown, Inner West and Canada Bay local government areas identified in the Our Living Catchment Fauna And Habitat Report and on ground works and annual monitoring are ongoing. Five ecological health mascots for the entire Parramatta River catchment identified and management plans drafted. Enhancement of sensitive vegetation and habitat for migratory waders at Mason Park Wetlands by Strathfield Council, through targeted mangrove removal and weed control works, supported by volunteer bird monitoring at both Bressington and Mason Parks and an off-leash dog walking area at Allen Street Reserve. Enhancement of saltmarsh and other riparian habitat by Hunters Hill Council through bush regeneration of estuarine vegetation within Gladesville Reserve, Riverglade Reserve and Betts Park. Incorporation of habitat improvements, where feasible, into seawall upgrades undertaken by foreshore Councils, in accordance with the DECC and SMCMA (2009) Guidelines for Environmentally Friendly Seawalls. To manage erosion of river banks and seawalls, reduce environmental impacts, rehabilitate degrading shorelines and improve the social amenity of the estuary. Minister for Transport, The Honourable Andrew Constance, provides written assurance to the Parramatta River Catchment Group that “minimising ferry wash is a key criteria in the design process for the four new Parramatta River ferries planned”. Powell’s Creek naturalisation project underway by Sydney Water. The City of Ryde is working with Transport NSW, RMS and Community to construct two small groyne structures (seawall wash breaks) to address foreshore erosion impacts effecting community asset and beach access. City of Parramatta has commenced a seawall audit of the approximately 8.2km of seawalls along its area of the Parramatta River. This audit will inform future repair and maintenance requirements and also investigate the possibility of making existing seawalls more environmentally friendly by providing improved habitat for local aquatic life. To encourage public access to the estuary and foreshores for a wide range of groups and communities while maintaining the river and estuarine health. Extension of the Parramatta Valley Cycleway Shared Path to the Parramatta CBD underway. Once completed this path will be 15km long and will consist almost exclusively of off-road cycle/footpaths. Incorporation of public access into new and existing developments during Voluntary Planning Agreement negotiations within City of Parramatta. Community research undertaken interviewing 1100 people (100 from each of the 11 Parramatta River catchment local government areas) to understand current community behaviour around the river, perceived barriers to swimming and the potential for increased activity as the river and surrounding areas are improved. Swim site activation framework developed and full concept designs underway for three proposed new swimming sites along the Parramatta River estuary. To adopt and implement a coordinated river health monitoring program and communicate progress to the community. Ongoing estuarine health monitoring as part of the NSW Office of Environment’s Estuary Monitoring Program. Ongoing recreational water quality monitoring at three designated swimming sites (Dawn Fraser, Chiswick Baths and Cabarita beach) as part of the NSW Office of Environment’s Beachwatch Program. Water quality monitoring at two water quality monitoring buoys, one upstream and one downstream of Duck River, with data available from City of Parramatta. 2018 Parramatta River Swim Report developed to show the current status of swimming in the Parramatta River. Business case developed for a future Riverwatch Monitoring Program for proposed new swimming sites in the Parramatta River.